I was super fortunate to report from Salomon's 2017 Ultra Running Academy in Moab, Utah last week. 16 athletes from the US, Canada, New Zealand, and Australia were selected out of 1500 applicants for a training camp with many miles of spectacular running, technique clinics on the trails, video and photography class, and classroom seminars. Salomon also announced a comprehensive effort to keep trail running a clean sport introducing a comprehensive and transparent athlete testing and health monitoring program in collaboration with Athletes for Transparency. At the conclusion of the Academy the runners participated in the Behind the Rocks 50 miler in Moab. I was invited to participate in everything, as best I could, with these speedsters... What a treat! The Academy was headquartered at the Red Cliffs Lodge about 15 miles down the Colorado River from Moab. The running was directly across from the Lodge, at Fisher Towers and in the Castle Peak area a few miles away. The coach/mentors/ included Anna Frost (2015 and 2016 Hard Rock 100 winner), Max King (Mountain and 100K World Champion as well as Olympic Trials marathon and steeplechase runner), Salomon team director Greg Vollet, and video/photography master Seb Montaz. 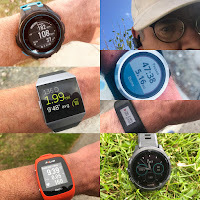 Of course there was gear in the mix as Salomon provided me with the new S-Lab Sense Set 5 vest (RTR review soon of the 5 and 8 models) along with a pair of the S-Lab Sense Ultra trail runners as well as shorts and t-shirts. Everyone was color coordinated in bright colors contrasting on the red rocks. Needless to say the gear performed magnificently. 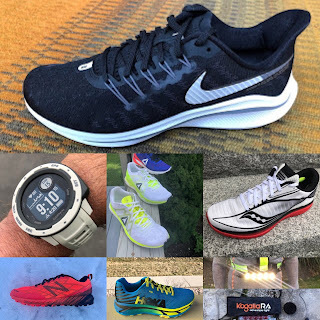 I alternated the S-Lab Sense Ultra shoes (RTR review here) with the Sense Pro Max maxi cushioned trail/road hybrid and must say I prefer the more secure somewhat firmer Sense Pro Max despite its heavier weight (review soon). A highlight of the Academy were the seminars on uphill trail technique, hydration, and nutrition. Many Thanks to Salomon for inviting me to this incredible event!